I'm thankful that my entire family uses the side entrance by the garage to enter the house. That way my front entrance stays clean and tidy. But the garage entrance ? YIKES. 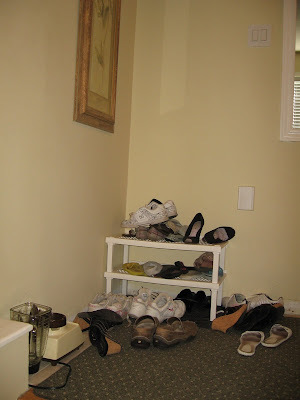 Shoes everywhere. Here is a no nonsense, truthful look at what it looked like in all it's glory! (No I don't normally make smoothies in my side entrance, but the blender was sitting there waiting for the next person to go to the basement to take it there, which means ME. I hadn't yet brought it downstairs, so yep, there it is too! I found a bookcase on sale. It was a display model. It was the perfect size to house all that junk. It was in pretty good shape except for few scratches. I could have kept it this colour but that particular entrance doesn't get much light, so I lightened it up and added some doors. That area is clean and tidy now. The surprising thing is...the kids actually open it and use it. what a great idea! i wish i had a space for something liket this! What a great solution to a messy problem. It looks beautiful and I love the doors you added. How clever. It looks like a door at the end of the hallway. Fits in perfect. Haha Denise! Don't we all!! Awesome revamp on this one! It totally suits right where it is. Love the fact that you can hide all the riff raff. This is a wonderful idea! I needed a bit more covered storage to hold our VCR tapes, and there is a 24" wide cheap Sauder-type warderobe office... So, the piece is now sitting in the hallway with the doors off. 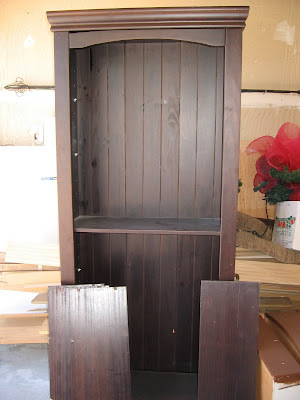 I am trying to get the gumption to paint it with homemade chalk paint! 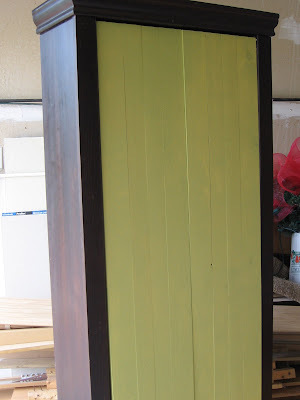 Funny thing - the doors on your piece are very similiar in color to the living room 'accent wall'. That's what color I'll be painting my doors! Now, please clear up a mystery: On Hometalk you said"This is where it stands at the end of the hallway near the 3 stairs that lead down to the garage door. The doors have since been repainted a light taupe, (since this was first posted). " 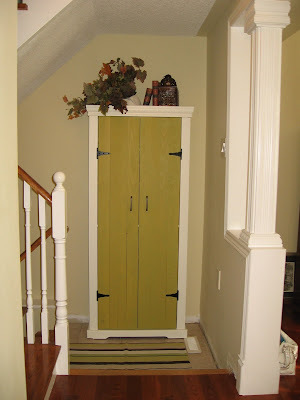 Is 'the door' the garage door or the doors on this cabinet?? 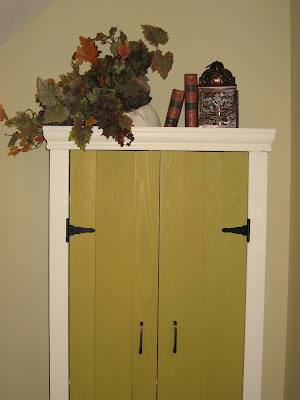 The doors on this cabinet are now a light taupe color. Actually that entire hallway has been painted a light mocha taupe as well. So things have changed a bit since I first posted this project. Perhaps I'll include an updated picture at the end of this post!